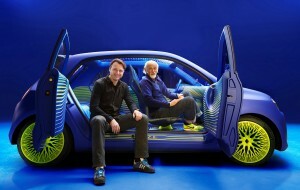 British designer Ross Lovegrove has unveiled the striking new Renault Twin’Z Concept Car. Furniture designer Lovegrove contributed to the car by conceiving and creating the Twin’Z’s impressive bodywork bumpers, lights, grilles, LED roofscape, wheels and interior. 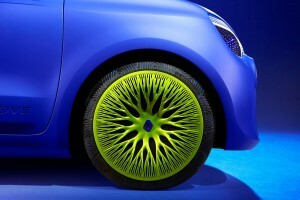 The result is a ‘fun, modern, artistic take on the citycar’, and it’s hard to disagree with Renault’s description. The all-electric rear-wheel drive, rear engine vehicle is just 3.62 metres in length with a high middle sitting on 18″ wheels; the compact footprint offers responsive handling. Amid the host of next generation design ideas is a front grille that creates an air vortex reducing turbulence and maximizing aerodynamics. Batteries located beneath the floor free up cabin space and delivers high quality handling. Twin’Z’s front and rear electric doors are hinged at the front and rear and have touch sensitive opening mech. Door mirrors have been replaced by an integrated video camera. Externally, the blueish clear-coat finish produces a velvety feel and the iridescence clearly has an electro look. The wheels glow green and the central core splits into slender branches ‘growing’ out toward the rim, a design made possible by parametric modelling and 3D printing. It’s the lighting, however, that’s’ the Twin’Z’s crowning glory. 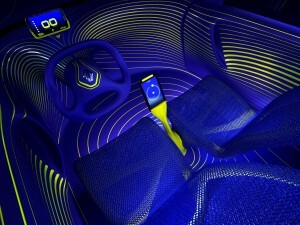 The all-LED lighting allows controlled light patterns. The front light assembly has been reduced to its smallest size and given a striking Renault eyelid. A lane of LEDs extends from the grille to the rear bumper over the roof and an array extends from the Renault logo over the windscreen pillars. The layered glass roof incorporates an LEDs which can form animated patterns. Rear clusters have been replaced with LED lighting incorporated into the glass (when the driver hits the brake pedal, a burst of the brake lights climbs gradually towards the roof). Passengers are hooded in a technological envelope that bathes them in a light which responds to the energy and pulse of Twin’Z. This roofscape heightens the sensation of space and blends seamlessly into the rear window. The interior is not broken up into separate elements and all passengers feel very much part of the travelling experience. The rear seat backs have been integrated into the floor-pan to create space and a new, informal aesthetic. Internally, a path of light runs around the cabin, illuminating the interior with a luminescent green creating an added sense of space. Green seat frame have been upholstered in a 3D woven, self-cushioning, lightweight breathable blue textile which is both waterproof and flame-resistant. Interestingly, there is no dashboard. The Twin’Z houses a tablet with a touchscreen display that is mounted on a centrally-positioned post and takes care of heat, seats, lights, roof and GPS while displaying speed, range and warning lights.